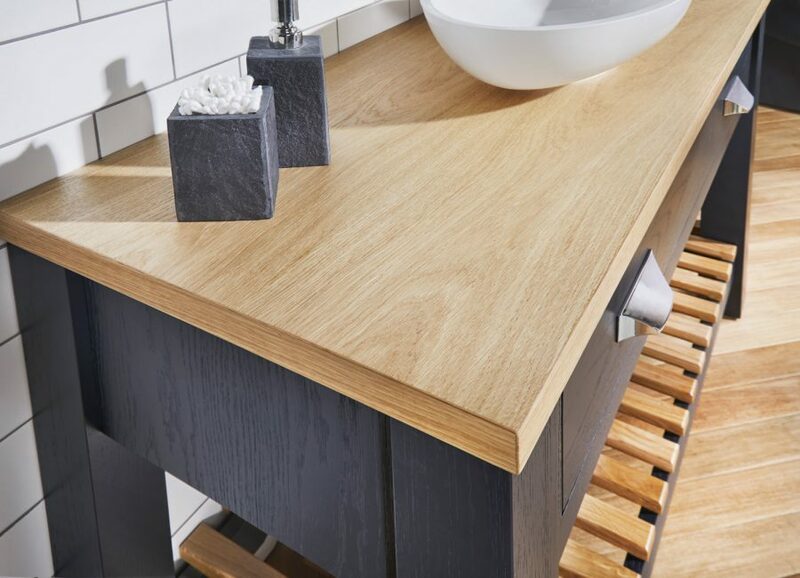 There’s no denying that wooden worktops look fabulous in any bathroom, but as with most natural products, there needs to be an element of upkeep to ensure that the worktop looks as good as the day it was installed. At Vanity Hall, rather than offering solid timber worktops, we have four stunning veneer finishes, so they have all the natural beauty of solid timber worktops but without the maintenance. Oak, Walnut, Chestnut and Dark Oak have been specifically chosen to complement our extensive selection of painted finishes and are especially suitable for use with our In-Frame collection. Providing all the aesthetic appeal of a wooden worktop, these four finishes offer the added practicality of a laminate worktop. Why choose a laminated veneer? Veneered worktops from Vanity Hall will not warp, something a solid timber worktop is very likely to do. Even if a solid timber worktop has been left to acclimatize over a period of time in the bathroom, en-suite or cloakroom that it is to be installed into, a sudden change in temperature can cause distortion. Is water ingress an issue? As long as any cut edges are sealed with silicon, which is approved for use in a bathroom, then a laminated veneer will look beautiful for many years. The same cannot be said for a solid timber worktop, which can be resistant to moisture for a period of time and then suddenly buckle. A veneered worktop simply needs to be wiped over with a damp cloth, ideal as the majority of bathroom worktops tend to come into some surface water from time to time. Water on the surface of a solid timber worktop should be avoided at all costs to avoid swelling and blackening of the wood over time. Plus a solid timber worktop will need regularly oiling and could require a gentle sanding, something simply not necessary with a laminated veneer. Don’t be mistaken, a veneer is real wood too! It’s just been manufactured to take on all the properties of water resistant laminate, but without the laborious aftercare. So why not request a sample today, to see for yourself the beauty of a Vanity Hall veneer worktop?